We last mailed out a newsletter in November 2016. I mentioned in the introduction that there was not enough room in the newsletter to detail some of the successes we had for our clients, which I am proudly placing in this newsletter. After the presidential election there were a number of changes at the Harris County Courthouse and the surrounding counties. Enclosed in this newsletter is our Harris County & Contiguous Counties court directories for 2017 which have been so popular over the years. If you would like any more directories please don’t hesitate to call the office. January marked the start of our 29th year in business. It’s been quite a ride since our inception. I have enough stories to write a book, but the names will have to be changed to protect the guilty. I can honestly say that I have the very best group of Investigators since our inception, who as a team work on many complex cases. Our team members are Keith Kucifer (27 years DPS), Edna Velez (14 years Customs & ICE), Jose Arreola (7 years University of Houston PD/Harris County)., Cindy Klein (10 years FBI), Paul Wisdom (17 years Dallas PD). One of our strongest assets is our ability to delegate investigative assignments to different investigators who possess the specific experience levels to handle the assignment. Both Edna and Jose are bilingual. The diversified experience of our staff allows us to work multiple cases at the same time. As is always the case, our team of Investigators leave no stone unturned in order to provide a quality work product for our clients. It certainly has been a pleasure supporting one of our clients, KIM OGG for District Attorney. Having worked with Kim in the past I know that the District Attorney’s Office is now led by a smart, ethical official who will treat all defendants with fairness. Last year I was at the Huntsville County Courthouse attending a hearing for one of our death penalty cases being handled by Katherine Scardino and Jimmy Philips. When I went into the men’s room I noticed the picture (left) taped to a divider between the two urinals. 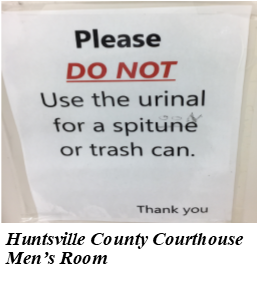 My immediate thought was, if we don’t know how to spell “spittoon”, is it feasible we know how to say “Not Guilty” ? Gradoni & Associates was hired by a Houston business man who had a number of concerns regarding the care for his father, who is in the acute stages of Alzheimer’s disease. Our client’s father had been living with his wife for 30 years and was quite well off financially.